CuTec Copper Socks Material: Unique, proprietary CuTec fiber made with copper-ion technology to bind copper to a fiber matrix of nylon and spun polyester and give the material attributes which allow it to be fashioned into glove inserts, knitted fabrics, narrow elastics, seamless apparel, socks, wound dressings, woven fabrics, and, of course, hosiery, just to name a few. Fabrics are produced using FYnesse STA•COOL technology which manages moisture by transporting it away from the body and to the fabric surface where it spreads quickly and dries fast. 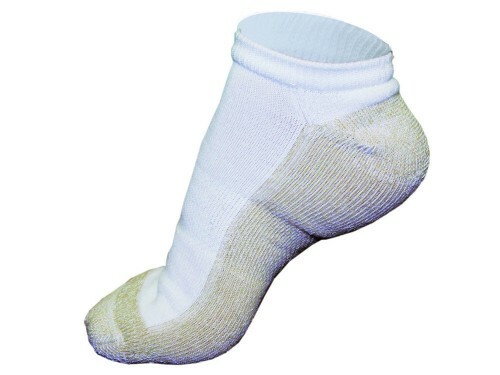 The heel uses “Y” technology to provide shape-to-fit comfort with a terrycloth bottom that provides excellent padding for the heel, arch, and forefoot while the flat toe seam is designed to prevent irritation around the digits. Benefits: Enhances circulation with a the stretchable, non-constricting top and CuTEC fibers help to improve the wearer's comfort, health, and even self-confidence by reducing odor, improving hygiene, and enhancing the look and feel of the wearer's skin. CuTEC has shown to be beneficial to skin by improving tears, bruises, scaling, tone, and more. Styles: Crew, Quarter Crew, Low Cut. Sizes: Small, Medium, Large, XL. Colors/Maintenance: All styles and sizes are available in black or white. Machine washable with cold water, no bleach, and able to be machine dried on low or air dried. 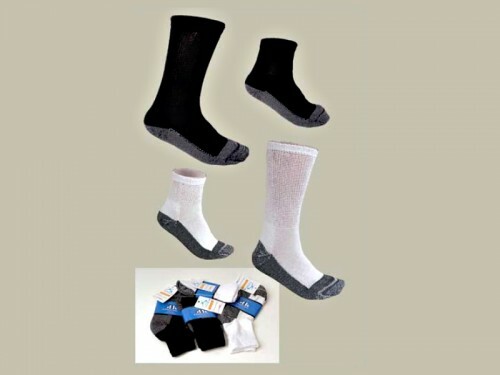 DIABETIC SOCKS Stride Lite Diabetic Socks contain AlphaSan®, an antimicrobial additive, that utilizes the natural power of silver, resisting biological odor and staining for the life of the garment. Begin by placing the open box on a solid, level surface and taking a seat in a sturdy, stationary chair. Position yourself so your bare foot can rest on the foam comfortably, but firmly, with your leg at a 90 degree angle. Using gentle force, press your heel about 3/4 of the way into the foam followed by your forefoot while maintaining equal pressure until the entire foot is pressed to the same depth. To avoid getting an inaccurate impression, DO NOT push all the way to the bottom of the box. Now it's time for the toes. Your foot will remain in place as you press each toe into the impression, one at a time, your fingers. Repeat the process with your other foot and then your Foam Impression Kit will be ready to go. 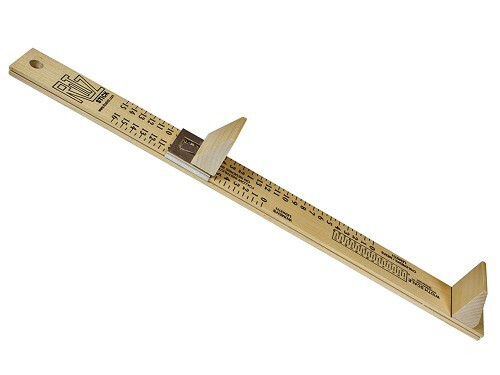 Ritz Stick Simple-to-use wooden measuring device makes determining the length and width of any foot quick and easy for anyone. 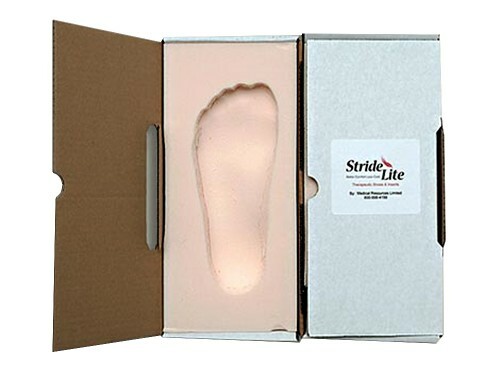 A tremendous value for those wanting or needing to find out such metrics, for themselves, a friend, or a relative, without having to consult a professional in person before placing an order for any form of footwear. 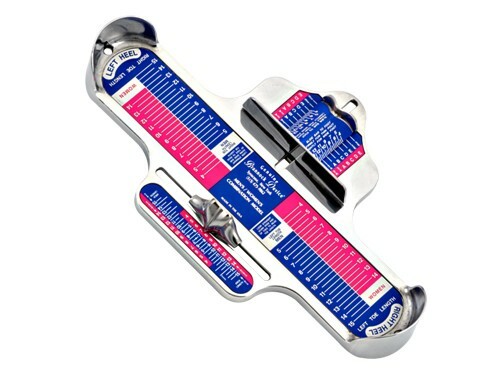 Brannock Device An improvement on the Ritz Stick, Charles F. Brannock's invention affords users the ability to quickly and accurately measure the foot in regards to length, width, and arch. Includes standard sizes for both men and women and is made of durable metal that is built to last, making this a tool owners will be able to utilize for many years and for many pairs of shoes and/or other footwear products.